It’s that time of year again, where we all gear up for National Novel Writing Month. And like every year, I’m making spreadsheets instead of actually working on silly things like, oh, a plot maybe. Who needs a plot, anyway. Have some work tracking spreadsheets instead! Thank you, thank you, thank you! I know that took HOURS of work and I appreciate it. A Dean Winchester NaNo tracker? In Excel? You are officially my hero. Thank you so much for sharing! Can’t get this to open on my Mac. Any way to get ahold of a raw excel version of the Castiel theme (hubba hubba) or maybe a .zip file? Thanks! Please make a version that Mac users like me and my kids can use! Thank you–love your work! OMG!!! They are awesome. Thank you thank you thank you. :) I cant choose one-they’re all so great. Grabbed the steampunk one for myself, but may I suggest a Sleepy Hollow (new fox tv show) theme and/or a Teen Wolf themed calendar? thanks for making a really thorough tracker, though. 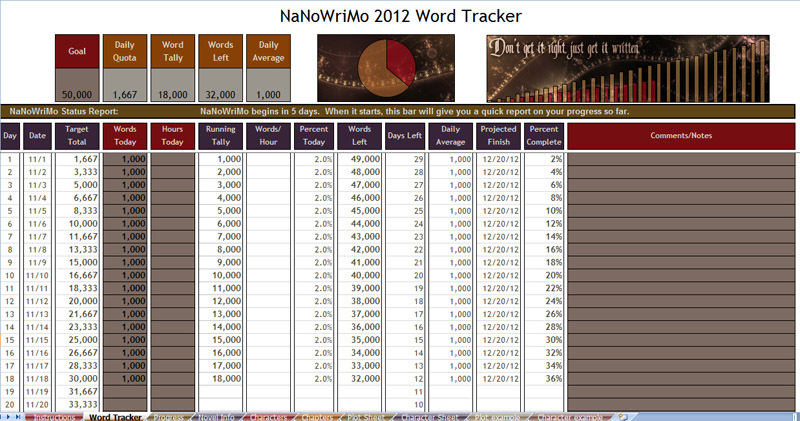 The one time I completed Nanowrimo I used a writing tracker. Thank you so much for making these! This’ll be my second year using one of your trackers and they’re so helpful. 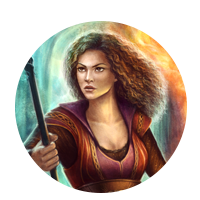 (: I’m currently planning on using the warrior woman one, I’ve edited it to work as a total wordcount one. I’m using your tracker for the 2nd year and I’m currently using your 2013 all year tracker as well. You’re a gift to all of us undisciplined writers. I really love these word trackers. While I found it pretty easy to construct a word tracker in and of itself, yours is not only very throughout but the design is really lovely as well. Especially as they aren’t too flashy. I really, really love them. Thank you for making them! I can only say what all the others did – you’re AWESOME! I’m from Vienna, Austria and trying to participate for the first time. Looking for word counters via google, I found this site. It’s a great help! Thanks for taking the time to make these. I love the Once Upon a Time ones. Rumpelstiltskin will be a great inspiration. Thank you so much for these! They’re a godsend – and so pretty! I love the purplish one (the first icon). Is there a way to get that year round? Just the main wordcount sheet for November of this year (2013) – December 2014?? 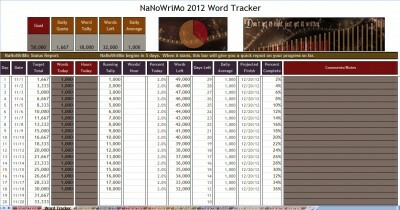 I’d love to have one to document my monthly progress all next year – just with the “Word Tracker” tab? I use your word tracker every year. Thanks for updating once again! Beautiful & functional…. in many years of NaNo this is probably the best spreadsheet I’ve found. Thank you! ohmygoodness. Thank you for the Supernatural ones! My NaNo is actually in the Supernatural universe so the Dean one especially is going to be perfect! Thank you!! Nevermind. Disregard previous comment. I apparently need more sleep. Can’t sleep, forums will eat me! I’ve needing something like this to help me-visually-better keep track and these rock. As for spreadsheet – I would like a year-round one please as, although NaNoWriMo is over I still have not finished my novel. It would be great to keep a daily record on how I’m doing, and Spreadsheets aren’t my forte. Thank you so much for making this available. I use even when it’s not Nanowrimo time! Thank you very much for making these! These tracking spreadsheets make organization so much easier!